On this week’s weekend edition of the Celestial Attic Podcast, we interview Jim Reed, President and co-owner of the Malted Meeple, a gaming center at 53 Milford Drive in Hudson Ohio that specializes in RPG and Hobby Games. The Malted Meeple is a fantastic place to host a party, run a game, or gather for a night of board gaming. Be sure to read and listen all next month for your chance to win milkshakes and gift certificates to the Malted Meeple in our August promotions ahead of our Worldcon party and The Picnic at the End of the Universe. We have your geek calendar and we discuss our Celestial Pick, Origins Game Fair. Of course, we continue talking with Cassandra Fear of Fear’s Confections. From amazing chocolates to 3D printing, there is always something amazing happening in her candy shop. She sees her shop as an event space as well as a source for amazing treats. For those hard-core gamers and local game publishers, tomorrow, Sunday, April 22 is an important day when registrations open for Gencon events. Gencon is the largest board and hobby gaming convention in America. Some of its events, like True Dungeon, sell out in seconds. True Dungeon places players in a real D&D style dungeon crawl complete with monsters, puzzles, magic and treasure. Other events focus the entire range of hobby gaming from old Avalon Hill games to the latest release of Pandemic. So if you are thinking of going, register for Gencon NOW, and then get ready at NOON tomorrow to try and lock those events in. The Event Catalog goes live this Sunday, April 22 at noon (Eastern) on gencon.com. With our new and improved search functionality, you can search for events and build your wish lists easier and quicker than ever! Event Registration will open at noon (Eastern) on Sunday, May 6. For those who have never participated before, it’s a good idea to build and submit a wish list to reserve your spot at events during Gen Con. Please keep in mind that popular events fill up quickly, so you may want to consider making time on May 6 to submit your event wish list. First, you must have an account on gencon.com with a Gen Con 2018 badge. When signed-in to your account, you may start adding events to your wish list through the event search tool. Adding the first event ticket will create your wish list. At that link, you may re-order your events, changing their prioritization. You may add events that overlap in schedule, but if overlapping events are all available, priority will be given to the highest ranked event in your wish list. All remaining events that conflict with tickets that you have in your cart will be skipped automatically during Event Registration. Head over to the forums for answers to frequently asked questions, chat about past events, and find other people to game with. True Dungeon has some exciting news to share – read on below! 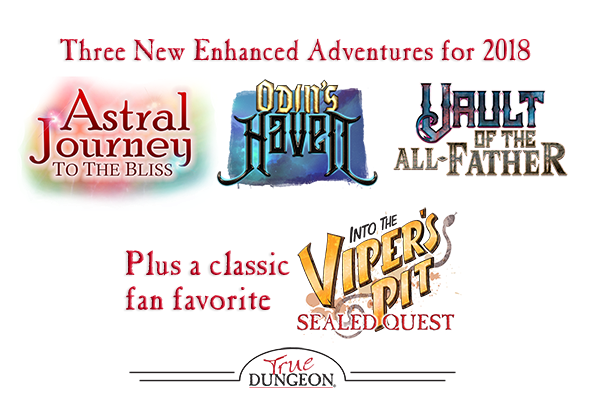 Enhanced Adventures: To take True Dungeon to the next level of immersion and fun we trimmed down from four to three main events, and we are using all that extra space and funding to provide bigger and more thrilling adventures. This unparalleled experience will transport players to three different realms where the immersion is never lessened by cramped curtained hallways. Instead, the entire expanded adventure will be well-themed throughout with the highest level of sets, props, costumes and special effects. True Dungeon will boast three consecutive adventures, and this is the third year of our four-year story arc. The events can be enjoyed in any order. “Astral Journey to the Bliss” Players will face many terrors and challenges as they venture across the Astral Plane to give chase to a mind slayer bent upon a grand scheme to gain a set of powerful relics. “Odin’s Haven” The party must venture across a frozen landscape to locate a temple of Odin. Perplexing puzzles and bone-chilling monsters await! “Vault of the All-Father” This thrilling conclusion tasks the party with stopping the source of a vile evil that has corrupted Odin’s holy Hall of Smiths. Check out the teaser video for these three new adventures! We are also bringing back a more affordable fan-favorite adventure “Into the Viper’s Pit”. Only provided Treasure Tokens are allowed, and the fun is geared toward newer players. All adventures come complete with a free 10-pack of Treasure Tokens, a limited-edition Completion token and at least three draws from our random Treasure Generators. Complete event details can be found HERE. Curious about True Dungeon? Want to explain TD to friends? Check out this short video HERE!